The grumpy part is probably partly due to the tired part, but it’s also because I’ve just come from a very frustrating meeting. There’s a part of my job that I really don’t like doing, even though strictly I am doing it voluntarily. I won’t go into details, but it’s something that makes me extremely uncomfortable, because I believe that it’s being done in the wrong way, and is probably causing harm to some people. However, I also believe it is actually necessary, and for it not to be done would cause even more harm. I’m not in a position to make the major changes to the process that I strongly believe are needed, so every time I go to a meeting about it, I just get frustrated seeing everything that’s wrong with it. The catch is, if I wasn’t at those meetings, it would be done even worse – I’ve at least managed to help make sure that the system is followed correctly (which they weren’t doing before), so although the outcomes are still unfair, at least they’re a little less unfair than they were. It’s kind of analogous to a vegetarian working in a freezing works, who believes that the animals shouldn’t be being killed at all, but knows that they will be anyway, so chooses to continue to work there because at least s/he can make sure they’re killed as humanely as possible. That’s the kind of moral conflict I’ve been feeling about these meetings. I hate what I’m doing, but I’d hate myself more for not doing it. Sorry, ignore this. I’m not looking for any advice or comment (I haven’t given you enough meaningful details to allow that, anyway) – just wanted to have a little rant and get it off my chest. I went to a really interesting seminar yesterday, about the way we use stories in our lives. What the speaker pointed out was that when we (especially women, according to her, but I can see how this applies to men as well, though sometimes in different ways) talk to our friends, a lot of what we’re doing is telling stories about our lives. Whether we’re describing our day, or contributing an example of something being talked about, we’re actually weaving stories, which we use to share our lives, to build relationships, to express what’s important to us, to construct an identity – basically, to say “this is who I am”. These stories don’t have to be long, or well-crafted, but they share a moment of our lives with someone else. As she talked (and shared some of her own stories), I thought about my own friends, especially the women, and how when we get together we often re-tell the same stories, but although we already all know the plot, the sharing of them again is still important, in the way it re-expresses our shared history. And I thought of the way we pass on each others’ stories (“I knew someone once who…”), and how that broadens each of our experience of life. And of course I thought of all the “imaginary friends” I know only through their DD and LJ blogs, and how telling stories is necessarily the only dimension to our friendship, and yet how much those friends feel just as real and close as the people I see every day in “real life”. So thank you all for your stories. May we continue to share them together. I released a few books around the Arts Centre while we were there (did you expect anything else? ): The Juniper Tree by Barbara Comyns, Very Good, Jeeves and Pearls, Girls and Monty Bodkin by PD Wodehouse, The Overlanders by Dora Birtes, and The Dust Roads of Monferrato by Rosetta Loy. Talking about Bookcrossing (when am I not? 😉 ), I kind of “came out” about being a bookcrosser to some of my work colleagues yesterday. I’ve generally kept quiet about bookcrossing at work, mainly because I like to keep work totally separate from my personal life. However, a while back I while PMing new members I realised that one of them (waveweaver) was someone I knew from work, so I revealed my secret identity to her. Anyway, she was at this seminar yesterday, so of course at afternoon tea afterwards we were talking about bookcrossing (she’s been very busy, so hasn’t been able to come to any meetups yet, but she’s still keen), and I was telling her about 2009. A couple of the other women nearby overheard me saying I was organising a world convention, and asked what it was for, so of course I had to explain, and tell them about bookcrossing (they sounded pretty interested, actually…) They both work in another part of the organisation, so it’s not like I’ve come out to my actual day-to-day workmates, but I’m starting to wonder how long I can keep this anonymity up. Especially when one of them started saying they should feature me in the staff newsletter in the section about “interesting hobbies our staff have”…. Eeek! I had another lazy weekend this weekend, but this time I really did need it – last week felt rather frantic. For a start, I had an essay due on Thursday. Which of course I didn’t finish last weekend like I should have. Maybe if I’d actually considered what I had on during the week I would have, because I was out on Monday, Tuesday and Wednesday night, which didn’t leave a lot of time for essay-writing (I did manage to get it done, by sneaking some time at work, but it was a close thing – I was putting the finishing touches on it two hours before the deadline. On Monday night I went to an ESOL-HT seminar about listening skills to launch a new CD and book they’ve just had published. It’s going to be a great resource, because most of the CDs and tapes out there to help people learn English are produced overseas, and it’s really important for learners to hear NZ accents when they’re learning, so they can understand the people around them. The only decent resource with NZ accents up till now has been for more advanced learners, so this one, which is pitched more at a beginner level, will be very popular. Tuesday night was meetup, but only me, MrPloppy, and lytteltonwitch were there. Awhina was sick, so they all stayed at home, Angela7715 is overseas, and none of the other semi-regulars showed up. At least that meant there was less temptation to take books home (Lytteltonwitch didn’t resist the temptation, though – I convinced her to take Somehow Form a Family by Tony Earley by telling her about its illustrious bookcrossing history). I released the other book I’d taken along, Ladie’s Man by John Ramster, in the bus exchange on the way home. Dunno if it will find an appreciative reader there, but I couldn’t be bothered hanging on to it until the next meetup. On Wednesday night I had my ESOL student. We had a great session, but as always it took a lot of concentration, so I was shattered by the time I got home. If I’m that tired just teaching, I’d hate to think how exhausted my student must be by the lessons – I’m just having to concentrate on making sure I’m understood and trying to understand what she says to me – she’s got to do all that AND remember the new stuff I’m teaching her! It was really nice to see her, and we had a fun evening playing games on the playstation and computers (we tried to be super-geeky and get a LAN party going, but for some reason although all three computers could see the network, we couldn’t get them to see the computer acting as server for the game, and seeing as our network is a bit delicate at the best of times, MrPloppy didn’t want to fiddle with it too much in case the whole thing died again, so we just went back to taking turns on 1-player games), but it wasn’t really what I was in the mood for. At least I got to make up for it with a totally lazy weekend. Next weekend’s going to be a busy one, so probably a good thing I did. It’s been dawning on me just how close October is getting, so I’ve been making a concerted effort to get on with my secret cross-stitch project. I managed to get quite a bit more done this weekend, so the deadline isn’t feeling quite as impossible now (though all that white is taking *so* long – there’s so many ever-so-slightly-different shades of white, it’s taking me twice as long as normal because I have to keep stopping to double-check where I’m up to in the pattern). Last night I was going to take a photo of the progress so far, but then I had the clever idea of using the scanner attached to the new printer instead. A clever idea apart from the fact that the software for it is dreadful – it’s supposed to be all wonderfully user-friendly, but they’ve acheived that by removing any choice from the user, so of course it’s easy – as long as you want it to do what they think you should want it to do… It produced a beautiful scan, but at such a huge resolution that it would have been impossible to post here, and the image editing part of the software doesn’t have a resizing function!!! I couldn’t believe that, so I even checked the help file, and no, you can’t resize the picture. You can crop, and you can adjust the colour balance (but only to certain pre-set levels), but you can’t resize! It doesn’t even tell you what zoom you’re veiwing the picture on, so you can’t tell what size it is anyway. Totally weird. Ok, so eventually I did manage to figure out how to fiddle with the resolution on the scanner and get a smaller image that way, but it’s a very awkward way of going about it. The finished picture’s going to be slightly too big for the scanner bed anyway (which is only A4), so I suspect I’ll be going back to taking a photo for the next picture of work in progress. …tend to gang agley due to the lure of a lazy weekend, or they do in my life, anyway. I had all these good intentions of spending the weekend working on my linguistics essay, preparing Wednesday’s ESOL lesson so I don’t have to do it at the last minute, testing out my new secret super-powers some more, and registering a few books. Instead, I read a lot, played The Sims 2 a lot, and generally spent a lot of time being as unconstructive as possible. I did manage to be slightly constructive when we got home, too, clearing out the fridge and making soup out of the sad old bits of broccoli and cauliflower that had been slowly wilting in the vege compartment (the soup turned out great, too – the recipe I used was for a broccoli and cheddar soup, but it worked just as well with a combo of broccoli and cauliflower). But after that burst of enthusiasm, I’m afraid the rest of the weekend was shot. I got a catch for one of the books I left at the Palms on Tuesday night: The Shining. A new member, too! Went to the movies last night, for the first time in ages. Lytteltonwitch had won a couple of free tickets, so she suggested MrPloppy and I could go with her, and just pay for the one extra ticket. So last night we went and saw the latest Harry Potter. I wasn’t as impressed by it as I have been by the previous films – it felt to me like they hadn’t put as much effort into it as previously. The effects weren’t quite so good, the CGI wasn’t quite as good, some of the acting wasn’t quite as good… none of it was actually *bad*, but I kept feeling like the director had said “oh, I can’t be bothered with another take, that’ll do”. Add to that some major departures from the book (I expected some differences from the book – it is a *very* long book, after all, and I knew they’d have to cut a lot out – but some of the changes didn’t seem strictly necessary and I think detracted from the story), and I was left feeling a bit unsatisfied. Which is not to say I didn’t enjoy the film – it was fun and suitably exciting, and if I hadn’t seen the others or read the book, I would have said it was great. It’s just it wasn’t quite as good as it could have been. There were some great bits, too, which almost made up for any deficiencies. Umbridge was wonderful – exactly how I’d envisioned her (hmm, do you get the feeling JK Rowling doesn’t like cats much? First Crookshanks, who while he turns out not to be as evil as he first seems, is still pretty nasty, then Mrs Norris, who is just evil, and now a really horrible character who decorates her office with cats… (MrPloppy and lytteltonwitch were joking that I’m in danger of turning into Umbridge, but I think I’m safe – I may have lots of cat artwork and cat mugs and cat earrings and cat everything else around the house, but at least I don’t wear pink! ;-))) And Helena Bonham-Carter makes a fabulous Bellatrix – she does do deranged wonderfully well. I released a couple of books in the cinema entrance (well, it was the *Reading* cinema we were at!) – both movie tie-in editions: Rounders by Kevin Canty and The Shining by Stephen King. The one I released on the way in was gone when we came back out, so hopefully that means it was caught by someone and not just put in lost property by a cleaner (I did think about releasing one of the books inside the theatre itself, but then I remembered the quick race-through-throwing-everything-in-the-bin cleaning most cinemas do after each screening, and thought it was probably safer not to). Lazy and productive at the same time – my perfect life! I definitely like this wireless concept. You can stay in bed half the morning and yet still feel productive because you’ve finally caught up with reading some of your friends’ diaries (so if any of you suddenly appear on the Top 10 list, you’ll know why – it’s because I’ve read a couple of months worth of entries in one sitting!). Of course, I’ll probably pay for it with a stiff neck for the rest of the day, but I’m sure I won’t be making a habit of it – I’m just enjoying the novelty of this portable internet thing. I did manage to spend the rest of the morning being more actively productive, delivering fliers for H’s business. He managed to get a few hundred printed for free (one of the perks of being “in the system” – you can get government agencies to help you out with things like that), so we’ve been going out every few days and doing a street or two – it’s amazing just how long it takes, and just how many mailboxes there are in a single street (and just how many streets there are!) – we haven’t covered even a fraction of his target area. I delivered the last of the free flyers today, so we’re going to have to bite the bullet and actually pay to get some more done. It’ll be worth it, though, because even with the small amount we’ve put out, he’s already had a couple of customers from them. So the printing cost will pay for itself pretty quickly. Now that I think about it, I’m not sure that I’ve actually mentioned here what H’s exciting new business venture is. 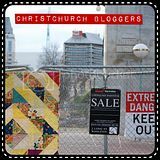 He’s set up a home computer consultancy, (PC Help (Christchurch) Ltd. He wants to provide a service to people (particularly older people) who aren’t all that computer savvy, helping them out with small repairs and advice, so that they don’t have to take their computer into a shop where they’ll be intimidated by the techie-types talking geek language. He’s one of those rare animals, a techie-type who can communicate well, so he thinks he can fill an important niche (and from the comments he’s had from customers so far, he’s right!). Yes, I’m sitting in the lounge, typing on the laptop, and connected to the internet completely without wires! (Ok, technically there is a wire, because the batteries on the laptop were running low so I’ve got it plugged into the wall, but no telephone wires are involved.) Yes, we finally got the wireless network up and running. It turned out to be both more and less complicated than we’d anticipated. MrPloppy’s original plan of going into town yesterday to buy a modem that was compatible with the router fell down when nobody had the model he wanted in stock (well, at least not at a reasonable price). So plan B was going to be to order one on-line, but then this morning I had a brainwave – when we’d bought the router, they’d said we could return it if it didn’t work with our modem. And you can get modems with built-in routers. And seeing as we’d have to buy a new modem anyway, and the cost of modems with built in routers is about the same as the two components separately, why not just take the router back to the shop and exchange it for a combined modem/router? So that’s, after a frantic hunt through the house for the various packing material, discs and useless bits of paper that belonged in the box with the router, exactly what we did. And it turned out to be an excellent decision, because setting up a wireless network when all the equipment is in one bit is a *very* simple process of just plugging everything in, running the software and, hey presto, everything works – a pleasant surprise after the week of frustration we’ve had trying to get the old modem and router to talk to each other. While we were in Riccarton exchanging the router, I finally forced myself to go shoe shopping (yes, I know, I’m letting down the whole of womenkind, but I find shoe shopping utterly boring!). My work shoes have finally totally fallen apart, and I’ve had to wear my gym shoes to work this week. Which, while it’s been lovely and comfortable, hasn’t been exactly professional looking. So I couldn’t really put off buying new ones. I’d intended to buy ankle boots, because I normally wear trousers rather than a skirt, and with boots I can get away with wearing socks instead of stockings (I’ve never particularly liked the feel of wearing stockings, plus I object to paying that much for an item of clothing that I’ll get a couple of uses out of before they get a run and I have to throw them away – a pair of socks doesn’t cost much more, and last for years!). So passing a shop that had a sale on their winter stock, I went in to look at the display of boots. I saw one nice looking pair, but they were a bit too big, and they didn’t have them in the next size down. And most of the other ankle boots seemed to be either impossible pointy-toed, or went too far the other way and resembled gumboots. I was about to give up and try another shop, when the assistant pointed out a pair of knee-length boots of a very similar design to the ones I’d liked, and in my size. So I am now the proud possessor of the first pair of knee-length boots I’ve ever worn since I was eight and mum let us have an old pair of hers for dress-ups. At this rate I might end up being fashionable if I’m not careful! Another side effect of mucking around with the network last night was that we finally set up the second printer. It came free with the laptop, but as we’ve already got a perfectly good printer, we hadn’t bothered to take it out of the box yet. But last night seeing as we were crawling around under desks with various wires anyway (so much for “wireless” network! ), we thought we might as well add a few more wires and set it up, especially as it’s got a built in scanner, which might come in handy. So what with the pretty flashing lights on the router (which aren’t actually doing anything useful yet, but they look nice :-)), and yet another piece of equipment cluttering the desk, the study is looking even more like a techy paradise than it normally does. Had a catch from the Dunedin trip already: The Roundtree Women by Margaret Lewerth, which I released in Oamaru, was caught by an anonymous finder. I also got an anonymous finder catch on another of the books we labelled in the Wellington YHA – Stormy, Misty’s Foal by Marguerite Henry. I’ve had an amazing number of catches from that bookshelf now – must remember it next time I’m in Wellington!